It's been a busy couple of weeks, filled with celebrations and a vacation. I recently celebrated a big birthday and we just got back from a wonderful trip to Charleston, South Carolina. 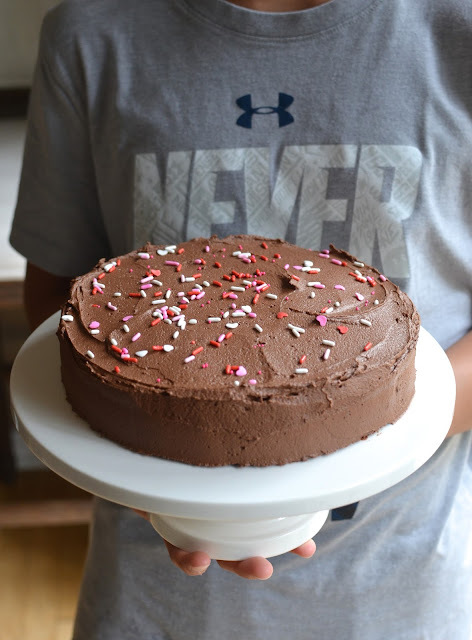 Before all that, I happened to be looking at some beautiful bakes from Style Sweet CA on Instagram and then spotted a simple chocolate cake on the site that I thought would be fun to make with my son. It reminded me of the Texas sheet cake we made together last summer and it, in fact, is that with a different type of chocolate frosting on top. Instead of making a sheet cake, we divided the cake recipe in half and made a single-layer 8-inch cake (I made just 1/3 the recipe for the frosting and it was more than enough). I decided to tag this as a "simple chocolate party cake" instead of "easy chocolate sheet cake" as the original is called since I baked it in the round, which I think is a bit more formal looking. If you bake it in sheet cake form, it's great to slice into small squares or rectangle servings for a crowd. The chocolate icing - given the high ratio of confectioners' sugar in it - is the kind that forms a bit of a dry crust on the surface. It's not what I'd call "fudgy" (which I think of as a smoother, more creamy, chewy texture like this) so instead of calling it a fudge frosting recipe as I found it, I'd say it's more a classic American-style chocolate frosting/icing on this cake. My son and I had fun in the kitchen preparing this cake. It's nice to sneak a few moments together doing something simple like baking or cooking. And the final reward of having a homemade cake can't be beat. As with all things homemade with care, it seems to taste all the better. Incidentally, I realized that we made this cake just a couple of days before my birthday (okay...not so coincidental...I may have planned it that way!) so I can say my son helped make me a birthday cake this year! If I sound desperate, sometimes I am. Making a Texas-style sheet cake is always interesting since it involves cooking over the stove. My son got into the action of making the batter. As for the frosting, it's a bit more of watching and letting the mixer do the work. We slathered it onto and around the cake - quick work with a single-layer cake. Before we knew it, the cake was done. I think it's fun to show kids how quick and easy it can be to make things like a cake from scratch. It's almost as easy as eating it! The cake is very tasty and moist. We happily ate it up in no time, which is pretty impressive considering my husband had also gotten me a chestnut sponge cake a couple of days before, too (luckily, it was small). Clearly, our capacity for cake - even among just the three of us - is fairly large. As I mentioned, I recently celebrated a big birthday...my 40th! I don't know how I find myself at 40. Not that it's "old" by any means but I just don't know where the time went. Maybe because I'm the youngest child, I got used to the feeling of being the youngest in the room, or close to it. That hasn't been the case for a long time but it's still hard to mentally catch up to my factual age! Anyway...I was lucky to be thoroughly feted by my family for my birthday. We started the day with a dreamy breakfast at home, then we headed out to spend the rest of the day and night in New York City. There, I did some of my favorite things - walking around midtown and doing some shopping for chocolates and home goods; I dropped by a bookstore for a good mystery book and stopped for a coffee break before heading to our hotel to get ready for dinner. We had a great dinner at The Polo Bar, then walked back to our hotel for the night. This year's birth celebrations were great though it might have been a bit excessive. We'll tone it down going forward but I suppose turning 40 is worth making a splash about. I feel like a very lucky girl (can I still call myself a "girl" at 40?). Make cake: Preheat oven to 375 degrees. Grease an 8-inch round cake pan and line the bottom with a piece of parchment paper. Place butter, cocoa powder, water, and espresso powder (is using) in a saucepan. Bring to a boil over medium-high heat, whisking until smooth and combined. Meanwhile, whisk the flour, sugar, baking soda, and salt together in a large bowl. Pour the chocolate mixture over the dry ingredients. Whisk until smooth. Add buttermilk, egg, and vanilla, whisking until completely combined. Pour the batter into the cake pan and bake until set and the top of the cake springs back slightly when lightly pressed with a fingertip, about 20-25 minutes. Cool slightly in the pan, then run an offset spatula around the cake and carefully turn the cake out onto a cooling rack, removing the parchment liner. Let cool completely. Make frosting: Cream butter in the bowl of a stand mixer until soft and smooth. On low speed, add salt, confectioners' sugar, cocoa powder, vanilla, and milk until incorporated. Continue to mix on medium speed, scraping down the bottom and sides of the bowl as needed, until frosting is smooth (adjust with more milk, if necessary). Add the melted chocolate, mixing until combined. Finish the cake: Place cake onto a serving plate. Frost, and top with sprinkles, if desired. Happy belated Birthday to you, Monica! What's better than a beautiful chocolate cake to celebrate 40th? Thumbs up for your son too helping you in the kitchen. Thanks. Can't complain about having too much cake, right! Happy Birthday Monica! Your son did an awesome job on this cake perfect ratio between frosting to sheet cake. A very happy Birthday to you Monica. Happy to know that you had a lovely holiday. And this simple cake looks so exotic to me. And how wonderful that you could make it with our son. Thanks so much...I appreciate that! Oh happy birthday Monica! 40 - such a baby :) Glad you had a wonderful day and so glad your son helped you in the kitchen. That is special so grab onto it as best you can! It does speed up a bit from here - just saying. Enjoy every day and eat chocolate! You are my go to place for chocolate cake. I LOVE them all. Happy, happy birthday! I hear you, Tricia. The last decade went by so fast (and it was so good). I can't imagine it going even faster but I'll bet it does and I guess that's life. Really going to keep savoring it and enjoying it best I can. All I need is my family and chocolate on my side, right! ; ) Thank you as always for the kind words! haha - I love that. Thanks, Bal! Happy happy birthday my friend! What better way to celebrate than do what you love the most with the people who love you the most in this world. The cake looks spectacular.The fact that it's chocolate makes it all the more special. Love it! Thank you so much, Sonali. I approached the birthday thinking what are some of my favorite things that I'd like to do...they're just simple likes like a leisurely breakfast at home, some time looking at things I enjoy, having a good dinner with my family, stopping for a coffee break, getting/reading a good book, and eating a few pieces of chocolate cake! : ) It was perfect. Thanks, Kelly! We do love to make and eat cake, for any reason or no reason! That does look like an excellent cake, that icing is just perfect. Hi Monica, so nice that you and your son bake together and what better than a chocolate cake. I'm playing catch-up at the moment. Happy belated birthday to you!! !